If you’re planning a visit to Alsace some time soon and would like to get a feel for the wines and the people who make them, I can put together a bespoke vineyard tour for and with you. Maybe you’d like to focus on the top names, clustered in the Haut-Rhin around Colmar? Or perhaps you already know these, and want to unearth new treasures that aren’t necessarily available in your country? Or maybe you want to concentrate all your efforts on organic and/or biodynamic growers, which are well represented in Alsace? And how about growers in the Bas-Rhin, the northern end of the Route des Vins, generally less well known and producing superb wines of great finesse? Tours are for anything between one and three people. After we’ve shaped the programme together, I make the appointments for tastings (between 2 and 3 per day) and reserve lunch in a restaurant. In summer or autumn we can often schedule a picnic. I will also provide you with suggestions on where to stay, depending on which wine growers we plan to visit. Your evenings are left free for you to do as you wish. Besides my mother tongue English, je parle courrament le français, también el espanol, sowie auch ein bisschen deutsch. If you’d like more information, send me an email here and we can discuss dates and options. my wife Rebecca and I are visiting Alsace between 3rd and 9th August, staying about 20 miles west of Strasbourg. 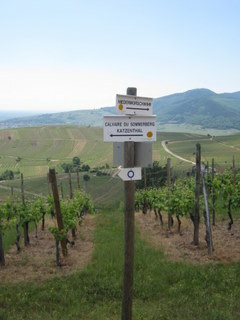 We would very much like to arrange to visit some vineyards on a 1 day tour. We will have our two teenage sons in tow as well, though may leave them to chill out in our holiday home. We are big fans of Trimbach, Zind-Humbrecht and Osterberg wines. I tried clicking on your email link but it didn’t work for me, hence the message via this route. We leave for Germany on 17th July.